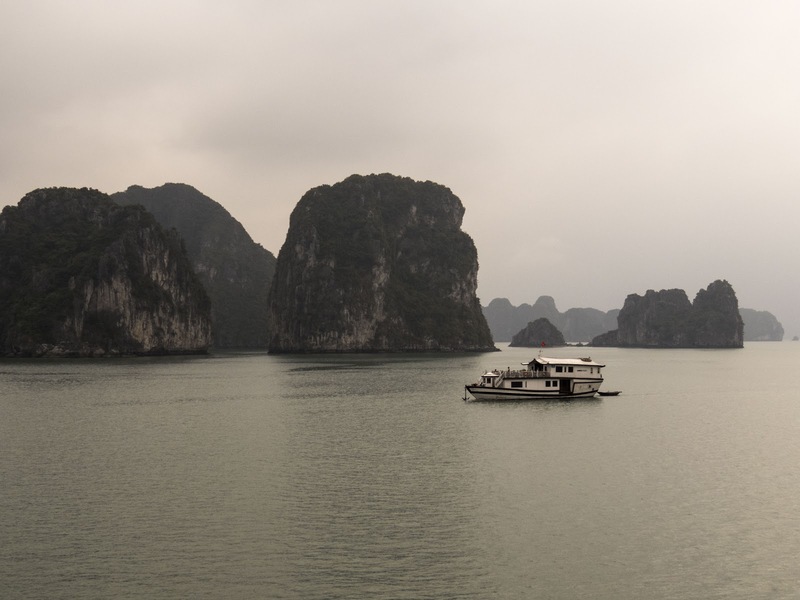 Most visitors to Hanoi and Northern Vietnam factor in time for an overnight cruise on Halong Bay. There are countless companies to consider when booking the trip and options to suit every budget and level of luxury. What are some things you should consider when booking a Halong Bay cruise? Most Halong Bay tours originate in Hanoi so you'll need to prepare yourself for a four hour drive each way. We were picked up in an air-conditioned van. An English-speaking guide accompanied the driver around to the various hotels to pick up passengers but then was let out before we embarked on the journey. The driver did not speak English but we got by with pointing and mime. Most tour companies stop at a midway point for a bathroom break and refreshments. There is no loo on the bus. Hundreds of junks of varying quality ply the waters of Halong Bay. You should keep in mind that you get what you pay for in Vietnam. Make sure to investigate the safety record of the tour companies you are considering. How old is the boat? Are there fire extinguishers on board? Do they stock enough life jackets for everyone? Halong Bay is one of the most touristed spots in Vietnam. Depending on which cruise company you choose, you could end up in a water-based traffic jam or a more more isolated spot. Find out where the tour drops anchor for the night and how many other boats you can expect nearby. 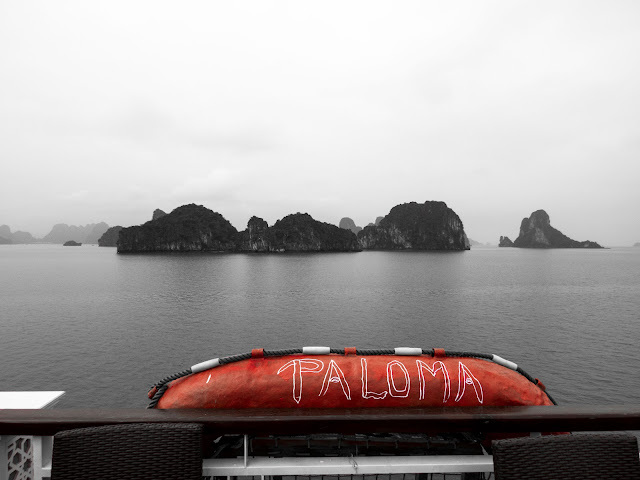 We chose Paloma Cruises for our Halong Bay trip, a mid-range option known for excellent food, a strong safety record, and for cruising to a slightly less touristed spot. The food near Hanoi is world renowned. We enjoyed amazing cuisine onboard Paloma. Upon arrival, we were treated to a multi-course feast of Vietnamese dishes. After lunch, the passengers accompanied our guide "Justin" as we tendered to a nearby cave. 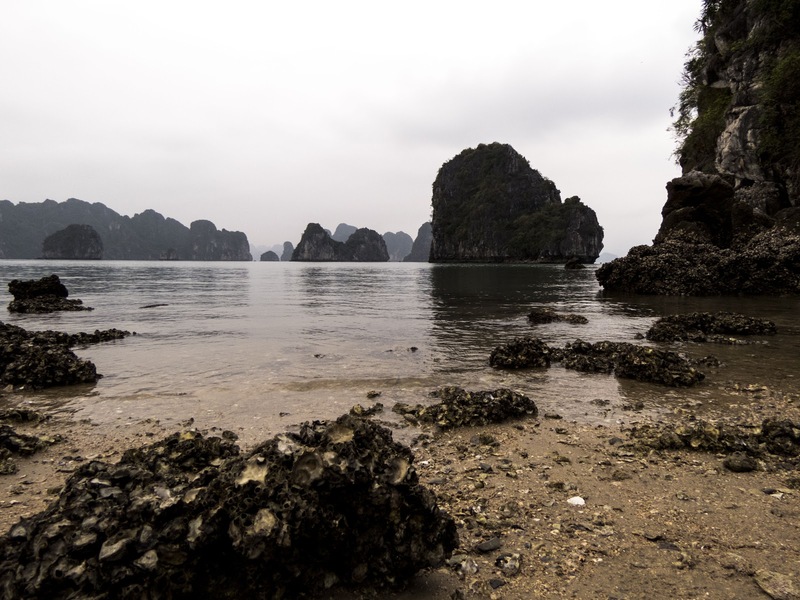 Here we enjoyed spectacular views of the rock formations that are Halong Bay's claim to fame. We were even able to walk up to the water's edge on the island. Positively stunning. After dinner once the sun went down, we crept back down to the tender. 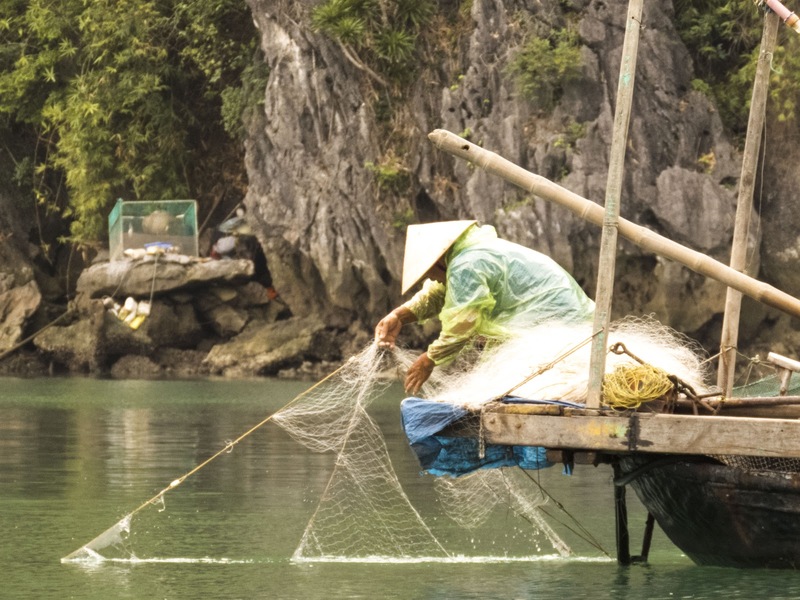 The staff shined big lights on the water and we went squid fishing, Vietnamese-style! The experience was oddly soothing. You essentially have to bob a lure up and down to attract the squid and repeat the motion until you get a nibble. I didn't end up catching anything but many people on the boat did. You could tell someone had hooked something when a stream of black ink shot into the water. The program aboard Paloma continued with a sunrise Tai Chi session. 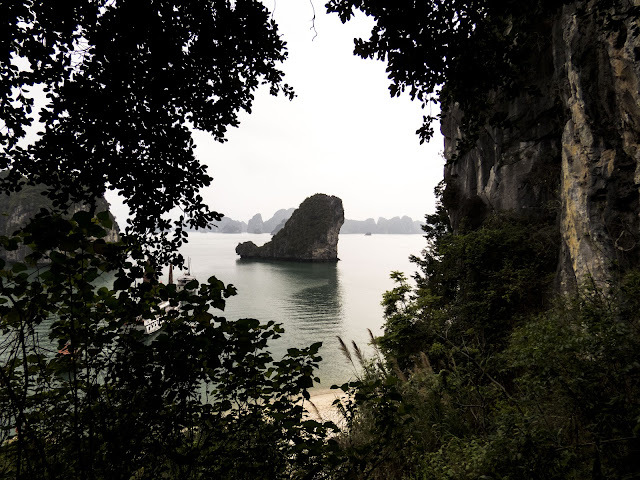 It was amazing to slowly and methodically stretch and move while peering out at the rock formations of Halong Bay. Such a peaceful scene. After breakfast, we rode by tender again to a floating fishing village. We got into small local boats and were paddled around by a local woman wearing a traditional Vietnamese sun hat. We also had the opportunity to visit a nearby pearl farm. A grain of sand is carefully inserted into an oyster and then the oysters are put back underwater for many months. At the appropriate time, the pearl is carefully harvested and crafted into a beautiful piece of jewelry. Back aboard Paloma, we had one final activity planned, a cooking lesson! The Paloma Cruises staff taught us how to make and wrap spring rolls! They even had a contest for the prettiest spring roll. Sadly, I didn't win. All of our creations were whisked away, deep-fried, and served with lunch. 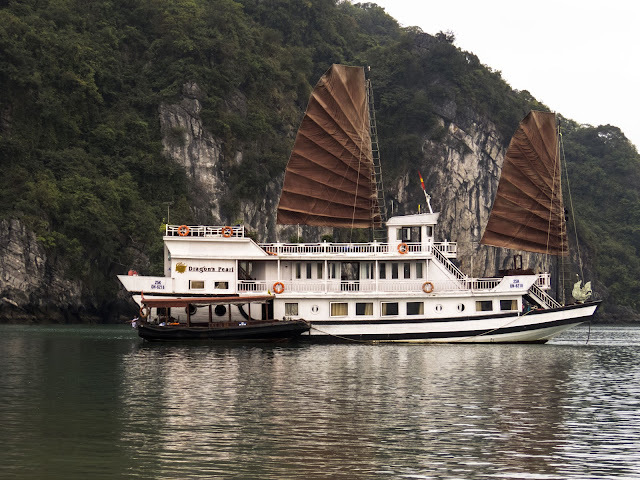 Our overnight cruise in Vietnam's Halong Bay ran like clockwork. After our pick up in Hanoi, the 4 hour drive left us at the dock about 30 minutes before departure. At every step of the way, the staff let us know exactly what was happening and when. I was really impressed by how well run Paloma's operation was and how many fun activities they were able to squeeze in over the course of a single night. We visited in April 2017 and paid $320 USD in total for two people including the round trip shuttle bus ride from Hanoi, a premium double room, and all meals (alcohol costs extra). Have you visited Halong Bay? Which cruise company did you use? How was your experience? 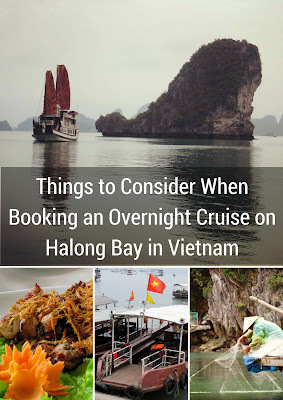 For more recommendations on choosing a Halong Bay cruise, check out Halong Bay cruise reviews from Thrifty Family Travel. Find out about important things to consider when booking a Halong Bay boat cruise in Vietnam and ride along with us aboard the Paloma.